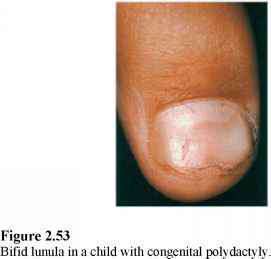 Congenital koilonychia associated with total leukonychia. Transverse overcurvature showing the three subtypes: (a) pincer or trumpet nail; (b) tile-shaped nail; and (c) plicatured nail with sharply angled lateral margins. There are three main types of transverse overcurvature: the arched, pincer or trumpet nail; the tile-shaped nail; and a third less common variety, the 'plicatured' nail (Figure 2.17). Table 2.3 lists some of the causes of transverse overcurvature, as seen in Figures 2.182.23. (a-d) Varying degrees of pincer nail deformity. Pincer nail is characterized by transverse overcurvature that increased along the longitudinal axis of the nail and reaches its greatest proportion towards the tip (Figure 2.18, 2.19). At this point the lateral borders tighten around the soft tissues, which are pinched without necessarily disrupting the epiderms. 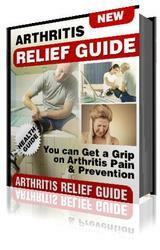 Eventually the soft tissue may actually disappear, sometimes accompanied by resorption of the underlying bone. Subungual exostosis may present in this way: the dorsal extension of bone producing the pincer nail (the exostosis) must be excised. The lateral borders of the nail exert a constant pressure, permanently constricting the deformed nail plate (unguis constringens). In extreme cases they may join together, forming a tunnel, or they may become rolled, taking the form of a cone. In certain varieties, the nails are shaped like claws, resembling pachyonychia congenita. 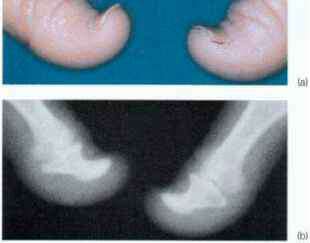 (a, b) Progressive worsening of the pincer nail deformity in 5 years. (a) Transverse curvature of nail; (b) transverse curvature of nail in yellow nail syndrome (before colour change). Transverse overcurvature in the pseudo yellow nail syndrome due to insecticide and weed killer. Transverse overcurvature in the yellow nail syndrome. is a developmental abnormality which may be an autosomal dominant trait. The pathogenesis of the nail plate deformation has recently been clarified: the great toe nail, which is normally curved transversely, spreads around almost 40% of the dorsal aspect of the base of the terminal phalanx. Radiographs demonstrate that in people with pincer nails the base of the terminal phalanx is widened by lateral osteophytes that are even more pronounced on the medial aspect of the phalanx. By widening the transverse curvature of the nail at its proximal end it becomes more curved distally. This can easily be shown by trying to flatten a curved elastic sheet at one end: the other end will increase its curve. The asymmetry of the lateral osteophytes explains why the lateral deviation of the nail is even more pronounced than that of the distal phalanx. 2 Acquired pincer nails can be attributed to wearing ill-fitting shoes. These nails are not usually symmetrical and the lesser toe nails are not generally affected. (a) Transverse overcurvature of nail: unilateral plicature; (b) transverse overcurvature of nail: bilateral plicatured variety (see Figure 2.17). 3 Underlying disease, such as subungual exostosis of the toes and inflammatory osteoarthritis, should always be looked for, especially if the fingers are involved. 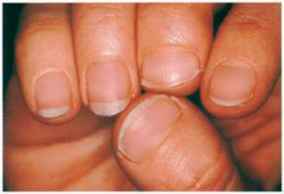 4 Some dermatological disorders, especially psoriasis, may also cause transverse overcurvature of the nails. 5 Localized overcurvature is observed in onychomatricoma. The tile-shaped nail presents with an increase in the transverse curvature; the lateral edges of the nail remain parallel. In the plicatured nail the surface of the nail plate is almost flat, with one margins being sharply angled forming vertical sides which are parallel Although these deformities may be associated with ingrowing nails, oedema due to the constriction of the enclosed soft tissues is unusual. In brachy onychia (Figures 2.26-2.34) the width of the nail plate (and the nail bed) is greater than the length. It may occur in isolation or in association with shortening of the terminal phalanx. This 'racquet thumb' is usually inherited as an autosomal dominant trait. All the fingers may rarely be involved. The epiphyses of the terminal phalanx of the thumb usually undergo closure between 13 and 14 years of age in girls, slightly later in boys. In individuals with this hereditary defect the epiphyseal line is obliterated on the affected side by 7-10 years of age, only occurring at the usual later age in the normal thumb. Since periosteal growth continues, the result is a deformed, racquet-like thumb. Brachyonychia of the thumb and middle finger. Brachyonychia—racquet nail of one thumb. 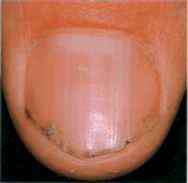 Racquet nails have been reported in association with brachydactyly and multiple malignant Spiegler tumours. 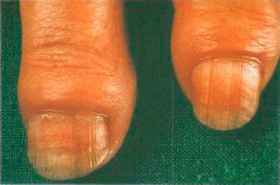 A syndrome of broad thumbs, broad great toes, facial abnormalities and mental retardation has also been described. Table 2.4 lists many well-recognized causes of short nails, while Table 2.5 gives details of the rarer hereditary and congenital conditions in which it can occur. In this symmetrical overcurvature of the free edge, some finger nails mimic the beak of a parrot (Figures 2.35, 2.36); this shape disappears temporarily if the nails are soaked in lukewarm water for about 30 minutes. This condition is often not seen in clinical practice because such patients usually trim their nails close to the line of separation from the nail bed. 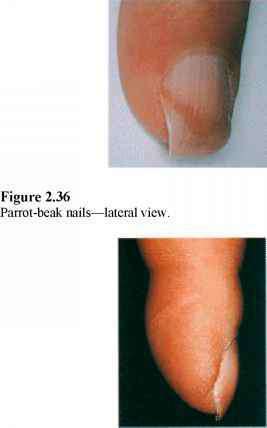 Parrot-beak nails are a typical sign of severe acrosclerosis with distal phalangeal resorption. The nail plate bends around the shortened fingertip. The round fingerpad sign describes a modification in the contour of the fingerpad, which changes from peaked to hemispheric. 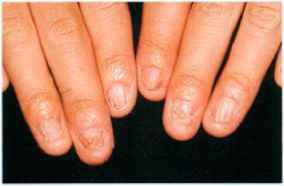 The sign is more common on the ring finger of patients with scleroderma or Raynaud's phenomenon (Figure 2.37). 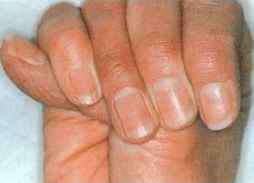 Nail configuration abnormalities 37 Fingerpad sign in scleroderma. (a, b) Claw-like nail—frontal and lateral views. One or both little toe nails are often rounded like a claw. This condition predominates in women wearing high heels and narrow shoes and is often associated with the development of hyperkeratosis such as calluses on the feet. Congenital claw-like fingers and toe nails have been reported (Figures 2.38, 2.39) Claw nails may be curved dorsally showing a concave upper surface, resembling onychogryphosis or post-traumatic hook nail. In the nail-patella syndrome when the pointed lunula sign occurs, if the nail is not manicured it will tend to grow with a pointed tip, resembling a claw. 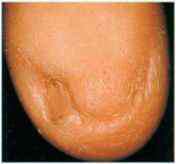 Hook nails (Figure 2.40) may be an isolated defect, congenital or acquired (e.g. traumatic). 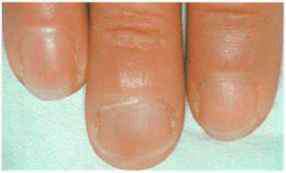 In Iso-Kikuchi syndrome (congenital onychodysplasia of index finger nails, COIF) there are two types of micronychia. The most frequent is medially sited; in 'rolled' micronychia the nail is centrally located (Figures 2.41-2.45). Figures 2.46-2.48 illustrate other examples of congenital micronychia. 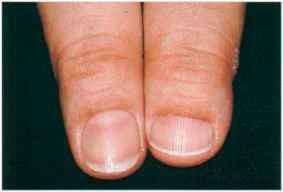 Overlapping of the nail surface by an enlarged lateral nail fold may result in apparent micronychia (Turner's syndrome). 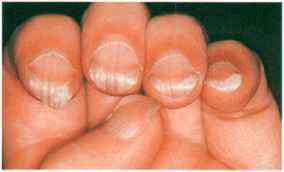 Micronychia—congenital onychodysplasia of index finger nails (COIF) syndrome. Rolled micronychia in COIF syndrome. Micronychia in congenital ectodermal dysplasia. Micronychia in a child affected by AEC syndrome (ankyloblepharon, ectodermal dysplasia and cleft palate). Macronychia of the middle finger. Macronychia with macrodactyly in Proteus syndrome. In macronychia the nails of one or more digits are wider than normal, with nail bed and matrix similarly affected (Figure 2.49). This may occur as an isolated defect or in association with megadactyly, as in von Recklinghausen's disease, epiloia and Proteus syndrome (Figure 2.50). Table 2.6 lists the known associations of micronychia and macronychia. Duplication of the thumb is a sign of congenital polydactyly, one of the most common anomalies of the hand. The frequency of polydactyly of the hands has been estimated to be 0.37%; it is more common than polydactyly of the feet (Figure 2.51). Seven types of thumb polydactyly can be distinguished according to the level of bone bifurcation. Patients with types 1 and 2 thumb polydactyly have two distinct nails separated by a longitudinal incision or a unique nail with a central indentation of the distal margin (Figures 2.52, 2.53). Symphalangism is commonly observed. Thumb polydactyly may be sporadic, usually transmitted as an autosomal dominant trait with variable expressivity. 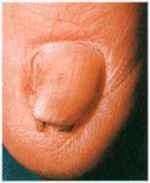 A similar clinical picture can be seen in the great toe with bifurcation of the terminal phalanx and duplication of the nail. Early treatment is important to maximize functional restoration and aesthetic results. 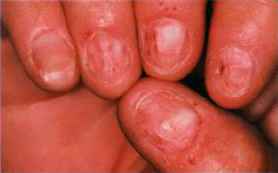 Patients with atopic dermatitis or chronic erythroderma may be 'chronic scratchers and rubbers'. The surface of the nail plate becomes glossy and shiny and the free edge is worn away (Figures 2.54, 2.55). 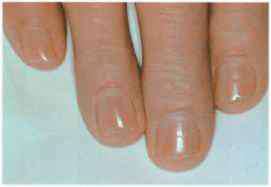 This condition, also called usure des ongles, may also occur in many different manual occupations. It has recently been described as a particular hazard of individuals handling heavy plastic bags. Worn-down, shiny nails (usure des angles), due to chronic rubbing and scratching. • distal fraying: trauma; Darier's disease (Figure 2.55); old age; nail scratching. It is impossible to differentiate completely between anonychia and onychatrophy in the light of current knowledge. In principle the term 'anonychia' (total or partial) is probably best reserved for conditions in which the nail has failed to develop; 'onychatrophy' should be used to describe processes in which the nail has initially formed satisfactorily and then shown total or partial regression. Table 2.7 lists the causes of anonychia and onychatrophy. 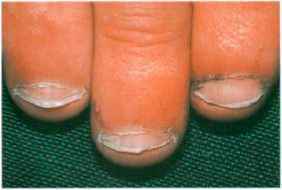 In aplastic anonychia, a rare congenital disorder occasionally associated with other defects such as ectrodactyly, the nail never forms. Loose, horny masses are produced by the metaplastic squamous epithelium of the matrix and the nail bed in anonychia keratodes. 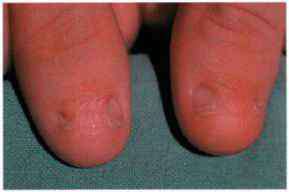 Hypoplasia of the nail plates is a hallmark of the nail-patella syndrome; in the least affected cases only the ulnar half of each thumb nail is missing. 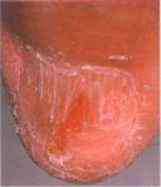 Onychatrophy presents as a reduction in size and thickness of the nail plate, often accompanied by fragmentation and splitting, for example in lichen planus. It may progressively worsen, scar tissue eventually replacing the atrophic nail plate. Partial anonychia in the nail-patella syndrome. Onychatrophy and koilonychia in cicatricial pemphigoid. Onychatrophy due to sarcoidosis with bone involvement. Onychatrophy in a child with epidermolysis bullosa dystrophica. Onychatrophy—lichen planus with total nail loss. 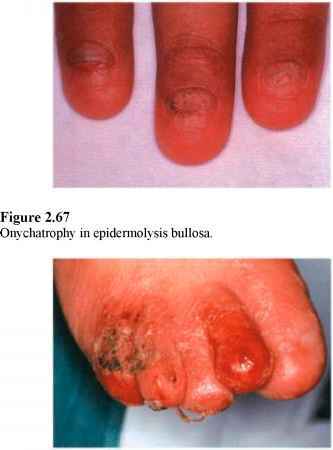 (a, b) Idiopathic atrophy of the nails: onychatrophy and anonychia. Dickinson CJ, Martin JF (1987) Megakaryocytes and platelet clumps as the cause of finger clubbing, Lancet ii: 1434-1435. Fischer DS, Singer DH, Feldman SM (1964) Clubbing, a review, with emphasis on hereditary acropachy, Medicine 43:459-479. Myers KA, Farquhar DRE (2001). Does this patient have clubbing? JAMA 286:341347. Hogan GR, Jones B (1970) The relationship between koilonychia and iron deficiency in infants, JPediatr 77:1054-1057. Stone OJ (1985) Clubbing and koilonychia, Dermatol Clin 3:485-490. Cohen P, Milewicz DM (1993) Dolichonychia in a patient with the Marfan syndrome, J Dermatol 20:779-782. Cornelius CE, Shelley WB (1968) Pincer nail syndrome, Arch Surg 96:321-322. Haneke E (1992) Etiopathogénie et traitement de I'hypercourbure transversale de l'ongle du gros orteil, JMédEsth Chir Dermatol 19: 123-127. Rubinstein JH (1969) The broad thumbs syndrome progress report 1968, Birth Defects: Original Article Series V(2): 25-41. 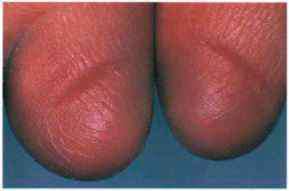 Mizutani H, Mizutani T, Okada H et al (1991) Round fingerpad sign: an early sign of scleroderma, J Am Acad Dermatol 24: 67-69. Kikuchi I (1985) Congenital polyonychias: reduction versus duplication digit malformations, Int J Dermatol 24:211-215. Telfer NR, Barth JH, Dawber RPR (1988) Congenital and hereditary nail dystrophies: an embryological approach to classification, Clin Exp Dermatol 13:160-163. Baran R, Moulin G (1999). The bidet nail: a French variant of the worn-down nail syndrome, Br J Dermatol 140:377. Anonychia and nail atrophy Zaias N (1970) The nail in lichen planus, Arch Dermatol 101:264-271. Tosti A, Paoluzzi P, Baran R (1992) Doubled nail of the thumb: a rare form of polydactyly, Dermatology 184:216-218. What does it mean to have nail clubbing? What cause tile shaped nails? 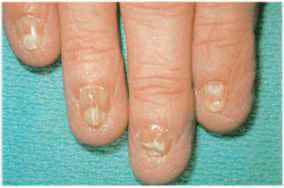 Can foetal alcohol syndrome cause nail dystrophy? 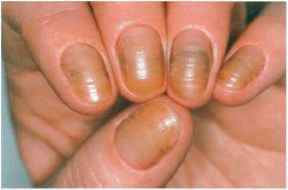 Is plicatured nails a disorder? What does pachyonychia look like? 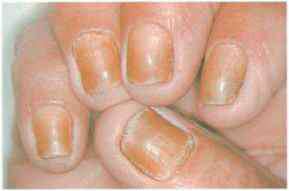 What causes pilcatured nail disorder? How to flatten curved nails? How to flatten bent toenails before and afters? What does clubbing of the fingers indicate? What causes claw shaped nails? What does scar tissue on fingernail bed look like? Can i get a fingernail transplant? How to cure plicatured nail? Does marfan syndrome have pincer nails?